In 1944, as a result of years of intensive German bombing raids, the Government addressed the urgent need to provide suitable housing to replace the many thousands of homes which had been destroyed. £150 million emergency funding was made available. Many designs were considered, five of which were selected and exhibited at the Tate Gallery, London, in May 1944. Various designs were tested at the British Research Establishment at Garston, Watford, before their construction was carried out. The variety of materials tested for suitability included corrugated asbestos lined with plasterboard for insulation and corrugated iron for the roof. Steel, aluminium and timber were also tested for strength, stability, insulation, maintenance and resilience. 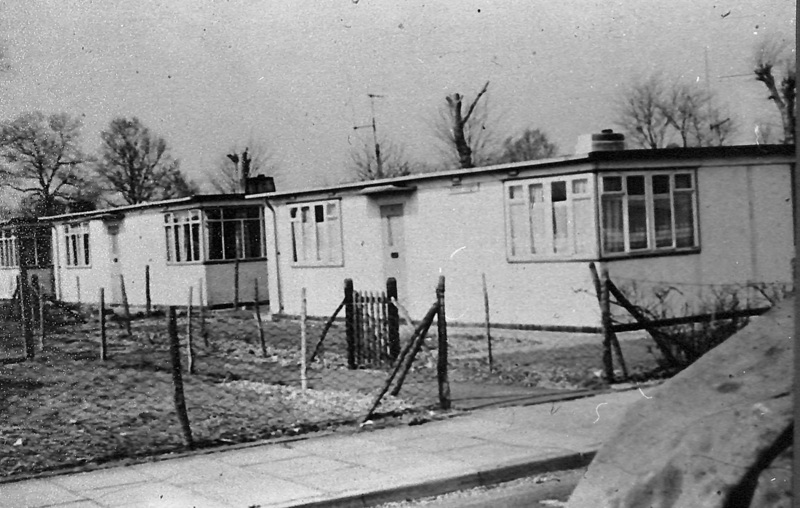 The Mark 3 type ‘Prefab’ was manufactured by The Universal Housing Company, Rickmansworth. The accommodation, made with families with up to two children in mind, comprised two bedrooms, bathroom with separate toilet, entrance hall and living room as well as an ultra modern (for the time) kitchen with refrigerator, modern gas or electric cooker and built- in cupboards. A hot air system provided a means of 'central heating'. Each home was given a small plot of ground for use as a vegetable plot. The buildings, supplied in kit form, were delivered directly to site and assembled in just a few days. 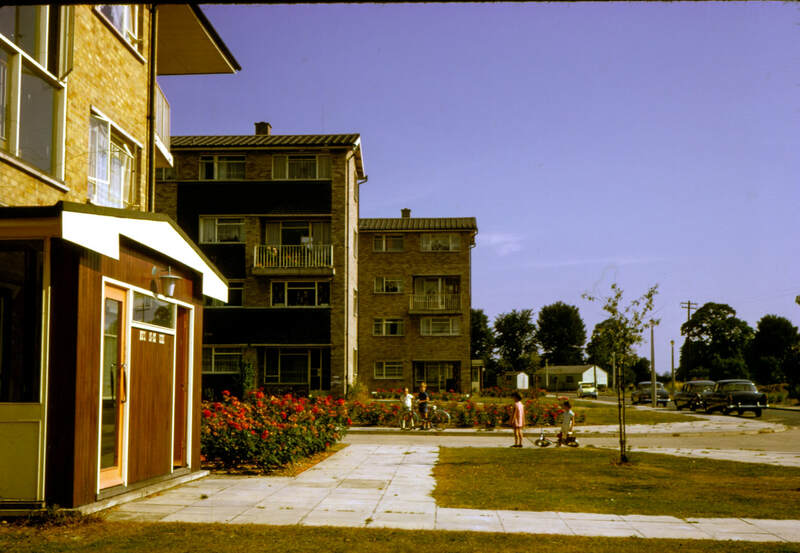 150,000 such homes were provided and erected over a period of five years and it was intended that local councils take up the scheme and build on vacant areas within their district. 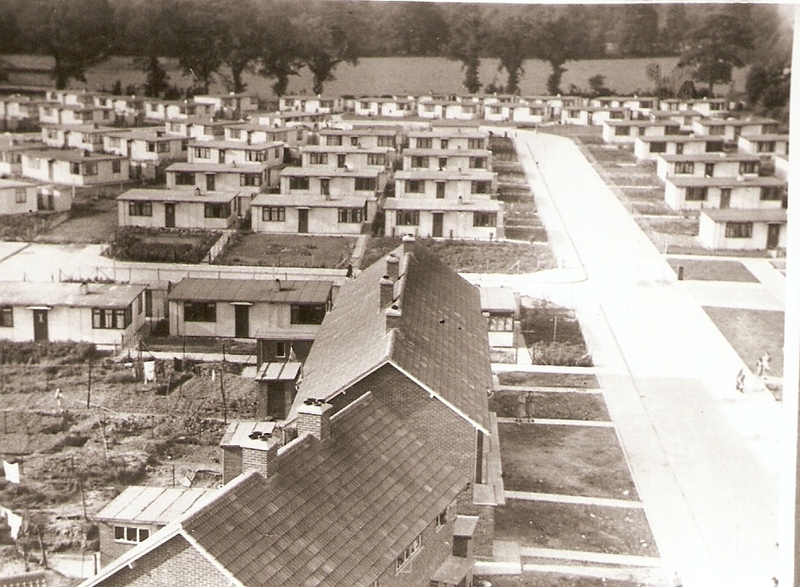 Locally, ‘prefabs’ were erected in Baldwins Lane in short rows with each row named after a tree or shrub. Families that were assigned these new homes were delighted with what seemed ‘modern’ facilities and they soon settled into a community. A small difficulty with maintenance became apparent when the council decided to charge the tenants 5 shillings for sweeping the chimneys. As coal fires were the norm, it was also the norm for a chimney to be swept on a regular basis as the build up of soot in the chimney itself could cause a fire. It was common practice for a chimney sweep to perform this task inside the house, covering the front of the empty fireplace and thus protecting the householder’s furnishings. Brushes were pushed up the chimney on poles that were extended, depending on the height, and the loosened soot fell and accumulated in the fireplace and was removed in a sack. This task was usually an annual event for most households but because of the prefabs’ design they had to be swept from the outside, with the brushes inserted from the top of the chimney, making the task more prolonged and as a consequence more expensive. The area is now Grove Crescent. Others were erected at the end of Fuller Way. 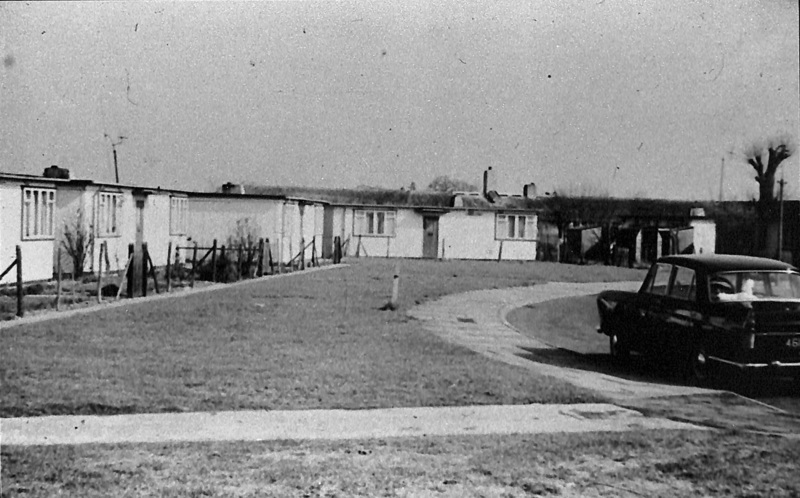 Although seen as ‘temporary accommodation’ and intended to last for approximately ten years, ‘prefabs’ were to be seen still in use in parts of the country for many years to come. 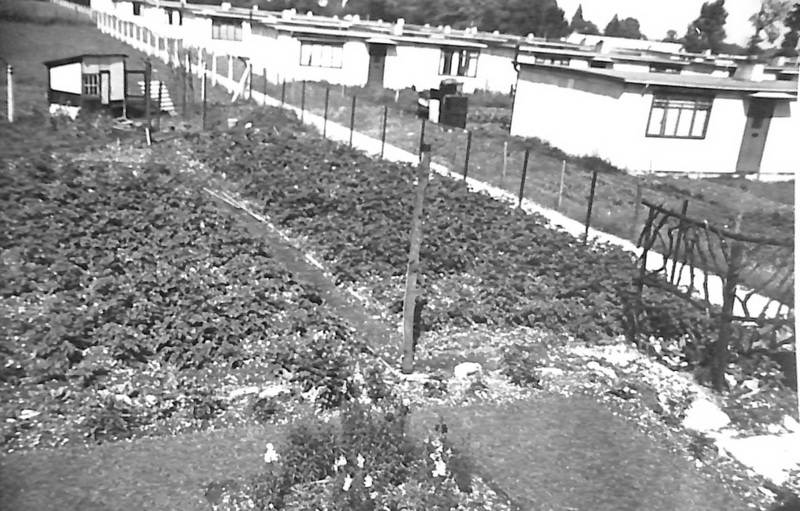 Land became available in the 1960's and Rickmansworth Urban District Council (RUDC) now Three Rivers District Council (TRDC) purchased the land and the prefabs were removed and flats and housing accommodation were replaced. Nearby, The Grove the name of a large private house was used to identify the new estate and is called Grove Crescent. 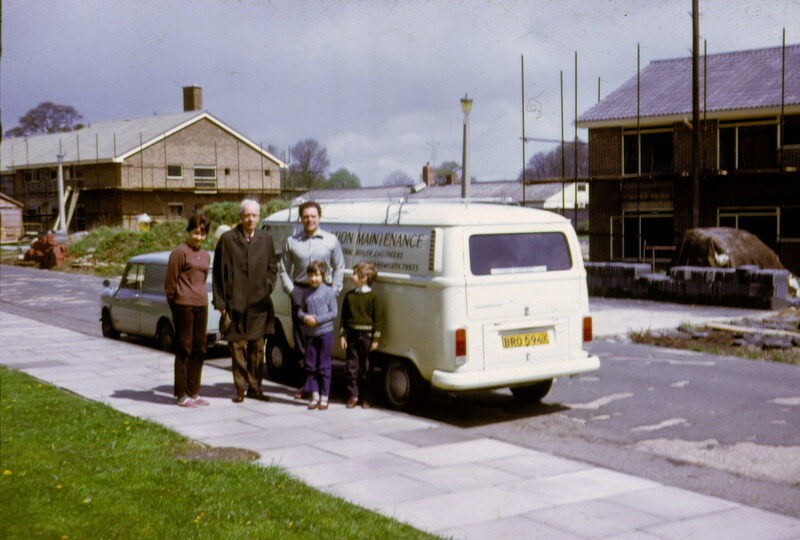 © 30th April 1972 building continues in Grove Crescent while local residents pose for a family photograph.